The Reefs has unveiled their Days of The Week event schedule, featuring Toni Bari on Piano Mondays, Movies on the Terrace Wednesdays, Tempo Band Thursdays, Latin Chill Fridays, The Big Calypso Saturdays, and Carvery Brunch Sundays, while also introducing their new Executive Chef, Douglas Sisk. A spokesperson said, “The Reefs takes pride in Carvery Brunch Sundays, especially having become known as “The Best Brunch in Bermuda”. Now the experience can be upgraded for $89. It includes the brunch our visitors have come to love and includes bottomless pour of Moscato or Prosecco. “In addition to the launch of these daily events, the Reefs is also pleased to offer bi-monthly Chef’s Table dining and cooking classes. Starting on June 4, 2014 at Royston’s, locals and visitors can dine at the Chef’s table for an eight course sampler menu with wine for $95 per person. “As of June 7, 2014, residents and guests can also book in for cooking classes at Royston’s from 12.00pm to 1.30pm for $45 per person. Cook a three course meal with friends and then enjoy dining on your exquisite creations. Reservations for these events will need to be made 24 hours in advance. “The Reefs Hotel and Club has organized daily and bi-monthly events on site for everyone, island wide, to participate in and enjoy. Having been voted Top Resort in the Caribbean, Bermuda, and Bahamas in Travel + Leisure’s World’s Best Awards Readers’ Survey 2012, the Reefs takes great pride in opening up their hotel facilities to locals and visitors alike, offering fun event options to participate in and a beautiful place to relax and enjoy spending time with friends or family. 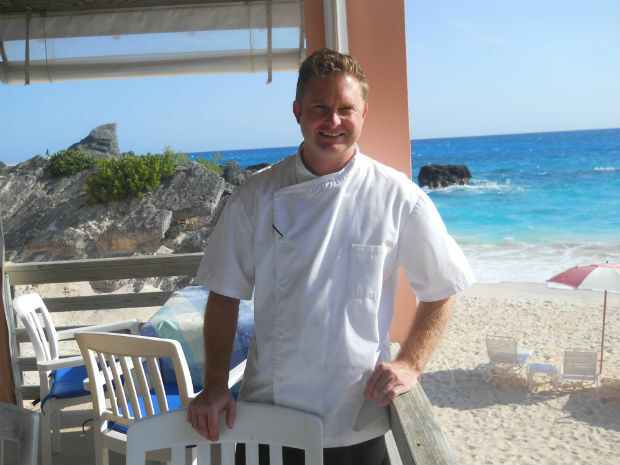 “The Reefs is also pleased to announce the newest member of their team, Executive Chef Douglas Sisk. Having appeared on many television shows and cooking for several celebrities and political figures, including President George H.W. Bush and Bill Clinton, as well as the Prime Minister of Jamaica, we believe our dining guests will be able to benefit from his 27 years of worldwide experience. Now this is how you do it…..very creative.